Heaven Sent was an ambitious episode of Doctor Who, following the death of Clara Oswald. 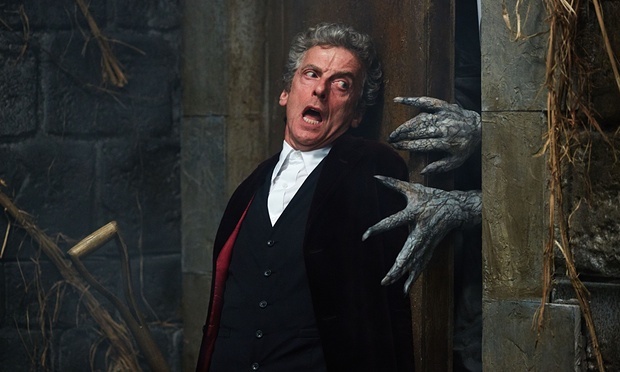 The Doctor is in a castle with moving walls and stalked by a monster who represents his greatest fears. Only confessing his deepest, darkest secrets will slow it down, but he ultimately dies and starts over, like Bull Murray in Groundhog Day. Before dying, he would retreat to a version of the TARDIS in his mind, and discuss his plans with a version of Clara, who also was only in his mind. Sometimes answers were provided on chalk boards. His escape might be in the twelfth room, once again giving more meaning to his artificial designation as the twelfth Doctor. He eventually realizes that every one hundred years a bird pecks on a diamond wall which is preventing his escape. He manages to reverse-teleport allowing a version of himself stuck in the hard drive to start over. (This might raise the question as to whether at the end he is really the same Doctor who we started out with, but considering that the entire universe has already been rebooted and recreated, this hardly matters.) The rooms in the castle all revert to their previous state (automated room service). After billions of years, of doing this, the wall would break down. You really must see this for it to make any sense, and I would recommend a second viewing. The meaning of this remains unclear. Maybe they are returning to the claims in the 1996 movie that the Doctor is half human, but I suspect there will be a different meaning. There are also other questions especially what will happen when he gets to Gallifrey? There are also questions about the recent past, give or take several billion years. Who trapped the Doctor and sent him to Gallifrey? What exactly is the confession dial? How does Ashildr fit in? These question may or may not be answered next week in Hell Bent. Doctor Who Extra videos for Heaven Sent can be seen here. A full length trailer for Legends of Tomorrow has been released, giving a far better idea of what the first season will be about. There are some minor spoilers out for the DC superhero shows. There are rumors that Constantine will be in season two of Heroes of Tomorrow, with a different cast from the first season. Other reports say that this might be a single season show, possibly replaced with a different show next year. Constantine’s parting gift to Oliver — a magical tattoo? — will come back to play soon. “Basically Constantine says to him that this is insurance against Reiter, and we’re going to deliver on that promise entirely,” EP Wendy Mericle says. “It’s going to help Oliver when he’s in a very dark place and time when he has no other way out. It’s going to be the thing that pulls him out of a very dark spot and literally saves him.” But whether he’ll be able to use it on Damien Darhk is another story. “The mysticism that Reiter is practicing may or may not sync up with what Damien Darhk is doing,” Mericle adds. There are rumors of a meeting between Supergirl and The Flash. They do have a lot in common in their first seasons. Both were mentored by a head of an organization or lab who were keeping secrets. I suspect both were evil, but we don’t know very much yet about Hank Henshaw. New scenes from Batman v. Superman will be shown during the Gotham season finale on Monday. Over on the Marvel side,the above trailer was released for Captain America: Civil War, with the movie to be released May 16. Some fans have been disappointed by the lack of Spider-Man in the trailer despite his planned presence in the movie now that Marvel Studies and Sony have come to an agreement. There is also the possibility that Captain America and Iron Man will appear in the next Spider-Man movie. I finished Jessica Jones on Monday, and it maintained the quality I noted last week. Unlike Daredevil, which did often have distinct stories within its general arc, the episodes flowed together like one long (and highly enjoyable) movie. Jessica Jones has a lot of Easter eggs related to the rest of the Marvel universe. If they ever decide to move beyond the Marvel universe, I recently noted aspects of Donald Trump which would work well to make him the evil supervillian in one of these future shows set in New York. The other major streaming series to premier the same day, Man In The High Castle, also looks quite promising but I haven’t gotten too far into this one yet. Both of these recent shows to start streaming might be good topics to write more about in December after most of the genre shows have gone on hiatus. Incidentally, TV Line has a handy chart of when shows are ending for the holidays, and when they are returning in 2016. Fargo has been renewed for a third season by FX, but Fox is moving Sleepy Hollow to Friday nights, where genre shows go to die. While better than last season, Sleepy Hollow still has not recaptured the quality of the first season. Some shows are better suited for more limited runs than is common on network television. I don’t think Fargo is as good as the first season (very few shows ever have been as good as the first season of Fargo, but the second season is still very good. It does benefit from having an entirely different story each year. Posted in Donald Trump, Science Fiction, Television. Tags: Arrow, Batman, Captain America, Clara Oswald, Daleks, Daredevil, Doctor Who, Fargo, Gotham, Groundhog Day, Heaven Sent, Hell Bent, Iron Man, Jessica Jones, Legends of Tomorrow, Man In The High Castle, Science Fiction, Sleepy Hollow, Spider-Man, Supergirl, Superman, The Flash. RSS feed for comments on this post.. TrackBack URL.